1.Spiral vane steel solid rigid casing centralizers are developed in response to the need for better cementing in high deviated and horizontal well. 2.Spiral vane steel solid casing centralizers are designed to provide optimum flow area. 3.The 360 degrees overlapping solid vane provides maximum wall contact and fluid swirl.Reduced flow area between the spiral blades produces a vortex motion of the fluids for more fluid velocity with direction. 4.The 30-degree slope of the vane end reduces drag and aids the caing in reaching TD. 5.This gentle flow from the body to the height of the vane will eliminate scraping,gouging or digging into the formation and consequently reduce balling between the vanes. 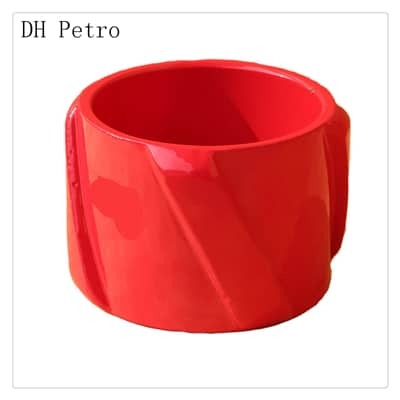 6.Spiral vane steel solid centralizer has high impact and shock resistance combined with tensile and yield strength as well as resist corrosion. 7.The Spiral vane solid rigid centralizer is normally 8″ long, but it can be manufactured to any length the customer requires. 8.These centralizers are available with or without set screws for eliminating of stop collars. 9.Spiral vane solid rigid casing centralizers are available for casing Sizes 4 ½” to 20”. 10.Any special sizes are available on request.